We’ve unveiled a new and exclusive Giorgio Armani Beauty Box pop-up within HEINEMANN Tax & Duty Free at the T1 International terminal. 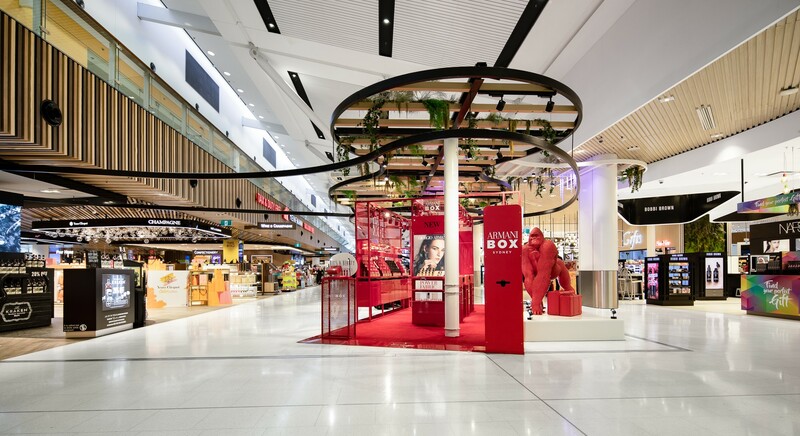 Set within a striking red box, Sydney Airport is the only location in Australia to host the concept which has been travelling the world. The pop-up features a curated edit of the Giorgio Armani makeup collection, as well as a unique Lip Maestro shade which passengers can only shop at the pop-up during its visit at Sydney Airport. Greeting passengers is Uri, a bold red gorilla statue created by Italian artist Marcantonio Raimondi Malerba, the statue is an homage to the original which resides in Mr Armani’s Milan residence. General Manager Retail Sydney Airport Glyn Williams said having recently been one of only three locations in Asia Pacific to showcase the Maison Christian Dior collection at T1, we’re thrilled to welcome in quick succession another Australian first with the Armani Box - an exceptional concept that adds a serious level of theatre to the airport journey.